July 27, 2016 July 6, 2016 by Beau H.
Editor’s note: Stock up on a full set of #menswear essentials at that link. We talk often at The Style Guide about holistic style — putting together outfits using the small details and looking to make style upgrades whenever possible. 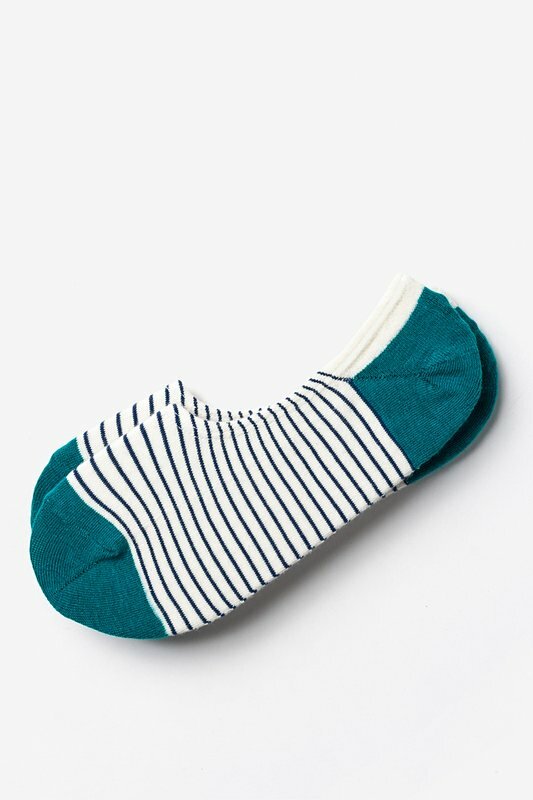 That should carry right on through to things like your everyday carry, and even smaller touches like the no-show socks you should wear this summer. So if those details are important, the gear that you bring along with you when hitting the road is all the more essential (at least in this writer’s mind). And let’s hope you’ve got some more summer travel in the works, in the meantime. Now, prepping in style for that travel starts with the big stuff — think a durable weekender bag — and whether you’re hopping on a train or hopping a flight, you need something that’s just as stylish to carry around the grooming essentials you should be bringing with you. It’s taken a lot of practice for this #menswear writer to get accustomed to planning out all those details, but it certainly pays off — and that’s definitely the feeling you should get when you pick up one of the best dopp kits to buy now. As for me, I’ll be packing up my own kit this weekend in fact — heading back to my home state of Michigan for a bachelor party should be quite the fun time. And as you’re planning out your next trip, take some time, check out the below picks and get those plane tickets booked. Simple, stylish and effective — exactly what you want from a great dopp kit. There’s a reason the fine folks at J. Crew sit so high up on this site’s Approved Brands list — they make a heck of a lot of head-to-toe men’s style essentials, and they do a darn good job at it. The Abingdon Travel Kit is just one of those pieces, made from a fine waxed cotton canvas and featuring details like burnished leather trim and brass-finish hardware. 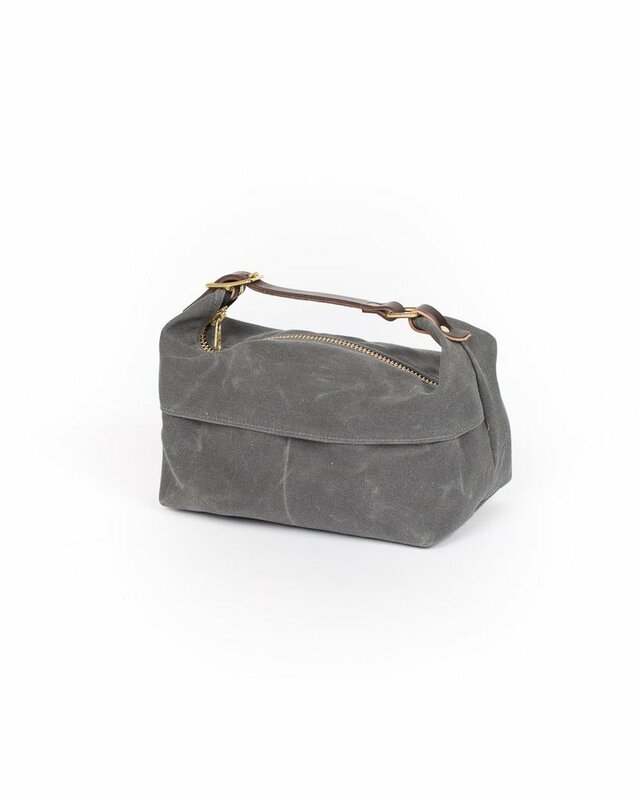 It’s the type of piece that would handsomely complement a rugged waxed weekender bag, and it’ll fit right in if you find yourself a fan of the brand’s classic style pieces — seriously, it’s tough to find a dopp kit that blends seamlessly with what you wear everyday. 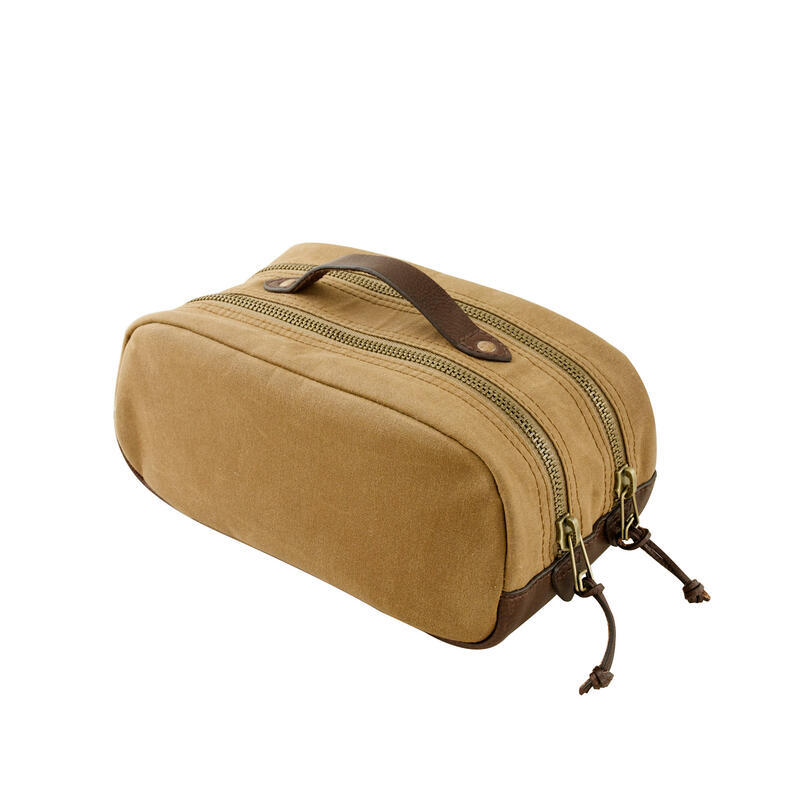 If that’s what you need, pick up this dopp kit ASAP. 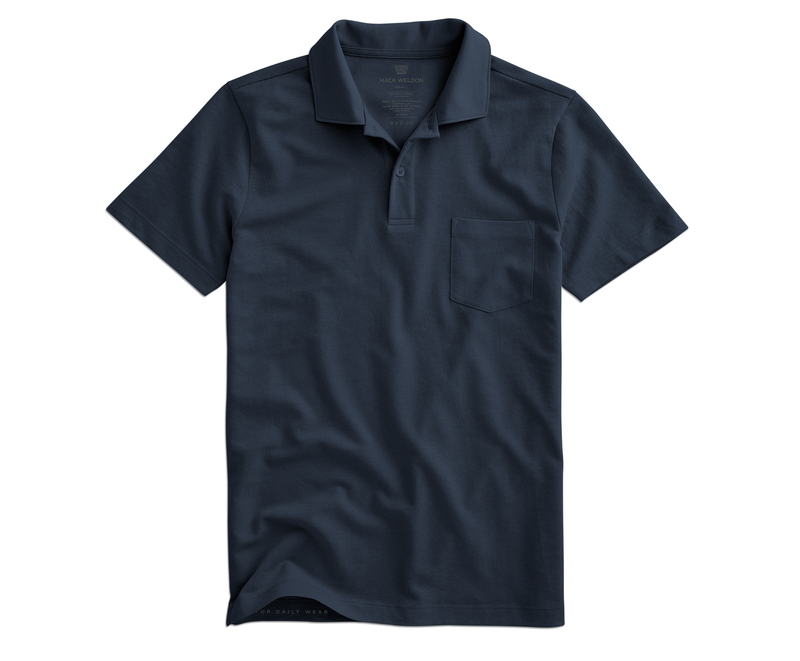 A navy color that goes with everything, plus durable fabric. For as much as J. 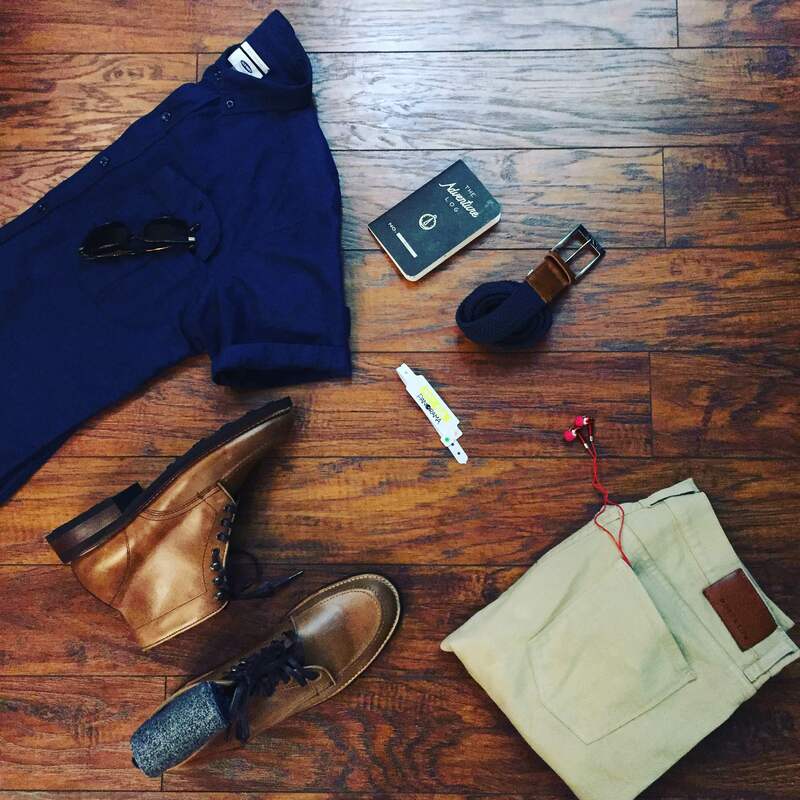 Crew has the head-to-toe style game handled, the team at Baxter of California has you all set with everything you might need on the men’s grooming front. The brand’s Dopp Bag is no-fuss, made out of navy blue canvas and featuring a distinctive logo on one side. It looks like it’s about the perfect size to hold several of the brand’s travel toiletries (or else, those little bottles you pick up from hotel rooms and the like. And the navy canvas should be durable and hold up well to getting tossed into a bag. For $25, that’s not a bad deal. Details like bridle leather accents and a carrying handle contribute to this bag’s utility. Before you balk at that price, know that with the way Wood & Faulk produces their goods, you’re getting a substantial return on your investment. The brand’s wares have popped up here on The Style Guide a few times before (namely in this essential chambray shirt #OOTD), and you’re certainly getting a handsome dopp kit here as well. 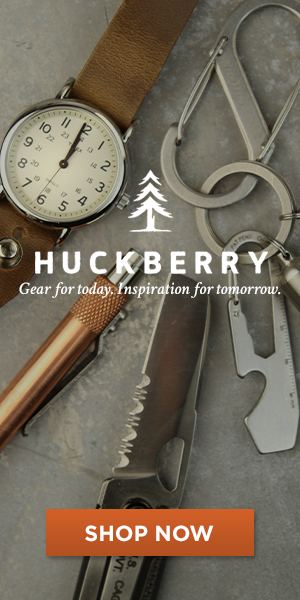 We’re talking heavy canvas, bridle leather accents and brass hardware, plus a handle that makes it easy to carry. The Grey color of the canvas should age quite well over time, and the nylon interior is easy to clean and ready to stand up to multiple trips. Definitely worth the price. There’s a heck of a lot of functionality — and extra goods — packed into one dopp kit. The Byrd x Richer Poorer collab is one that’s so much more than a dopp kit — wait ’til you see what’s in this one, in fact. You get a reliable dopp kit from Topo Designs, who certainly knows how to make functional everyday carry gear, and you get a plethora of other menswear goodies, including two pairs of Richer Poorer socks and a comb, “soap on a rope” and a light pomade from the team at Byrd Hairdo Products. You get all this for $74, and you get to keep the dopp kit — a good thing, as you’ll want to use it over and over no matter where your summer travels take you. A stylish leather dopp kit that … comes close to breaking the bank. 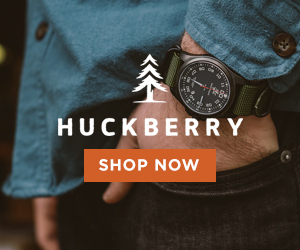 For as splurge-worthy as Shinola tends to be (and in spite of the trouble the brand has found themselves in with the FTC as of late), they’re still a favorite of this site for the approach they bring to manufacturing products in the U.S. 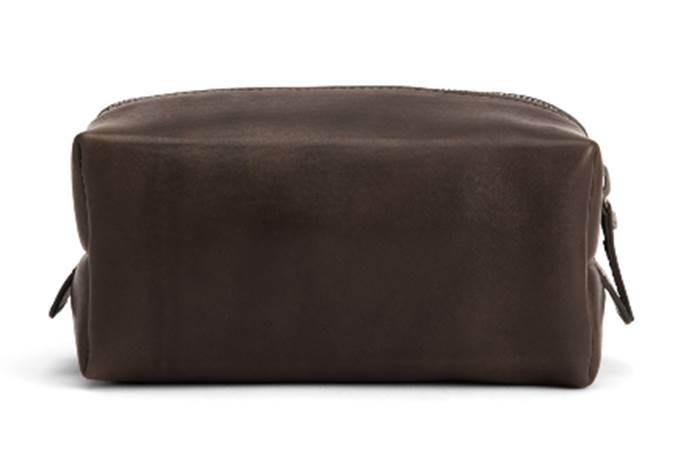 The goods really are high-quality, despite what doubters of the brand’s marketing tactics might say, so this dopp kit coming in at north of $200 makes it an investment … but a very solid one. If you do have the chance to check out the brand’s Detroit flagship (as I did on a trip to Detroit earlier this year), stop by if you’re a fan of quality design, display and merchandising. Hopefully, some of the above picks caught your eye (and perhaps the attention of your wallet, too). It’s certainly an upgrade and a change of thought to think of the case that carries your toothpaste as being part of your everyday style, but it’s thinking in that manner that can pay dividends across the board. Whether you reach for a rugged waxed canvas dopp kit or a more refined leather dopp kit is all a matter of taste — but any of the above should be able to work with (and fit in) everything from a stylish weekender bag to a suitcase fit for business travel. If you see any brands I missed, shoot me a tweet on Twitter or drop us a line at The Style Guide Facebook page. July 25, 2016 July 26, 2016 by Beau H.
Editor’s note: Start here for personal style #menswear coverage. The heat didn’t stop me from rocking out in style. Linen-blend shirt by Old Navy. Silm Light Mercer Denim by Mott & Bow. Natural Diplomat Boots by Thursday Boots. Millbrook Sunglasses by Steven Alan Optical. Mod Watch from the Timex x Todd Snyder collab. Here at The Style Guide, I’m pretty thankful to get to write about what I love every week. But it’s even better when I get to combine my passions into one post, as I did this weekend when I headed to the first-ever Panorama festival in NYC rocking some great men’s style gear and rocking out to excellent tunes along the way. Panorama was a unique merger of music, art and technology, curated by the same team behind Coachella – and Saturday’s lineup, featuring luminaries like Kendrick Lamar, Sufjan Stevens and The National, was stellar. The festival blended the buzzing atmosphere with some premium food and beverage curated in part by the great folks at Eater.com, too.And of course, the day presented the perfect opportunity for me to combine those aforementioned passions into one heck of an afternoon (although if you follow me on Twitter or Instagram, you’re aware of that!). Now, attending an outdoor festival in the heat of summer might seem like the opportune time to ditch decorum and dress to stay cool, but yours truly thinks just the opposite — bear with me. Of note, stepping out on Saturday put me right smack-dab in the middle of some very hot weather — it was sunny, beautiful and in the 90s here in the Big Apple. Even still, I was glad to be there as Panorama took over Randall’s Island, the site of this summer’s Governors Ball festival, (a similarly spectacular weekend). It was exciting to know that a quick subway trip brought me mere feet from (among others), The National, supremely talented purveyors of emotionally substantive music … but more on that in a second. Just know that for now, if you get the chance to see them, it’s a must. And if you manage to get as close as I somehow did, it’ll be even more astounding (just check out this video here, for one!). To tackle the festival in style, I reached for a new pair of Thursday Boots — they’re a big Style Guide favorite for the way they blend price, quality and styling potential, and I tested out the rugged-refined Natural Diplomat Boot this weekend. It’s made from durable Horween leather that provided just the right amount of toughness, edge and style, plus excellent grip and plenty of durability for playing a little air guitar during a high-voltage afternoon set from British rockers Foals. Of course, they had to be able to fight for a spot in the crowd during a visually stunning show by Sufjan Stevens — and before that, I did plenty of rocking out to The National, one of my all-time favorite bands and the group behind one of my all-time favorite albums (that would be Boxer …. or perhaps it’s Trouble Will Find Me …. or maybe Alligator…). The band’s incredible, emotional show came after a blisteringly hot day out and about, and it’s a good thing I had apparel that stood up to the test. Challenges with the heat started early, even during a high-energy, engaging set from British duo Oh Wonder to kick off the day (note that if you dig what you hear from them, they’re working on a new album!). Ready for a full day of rocking out. Linen-Blend Shirt by Old Navy. Slim Light Mercer Denim by Mott & Bow. Natural Diplomat Boots by Thursday Boots. 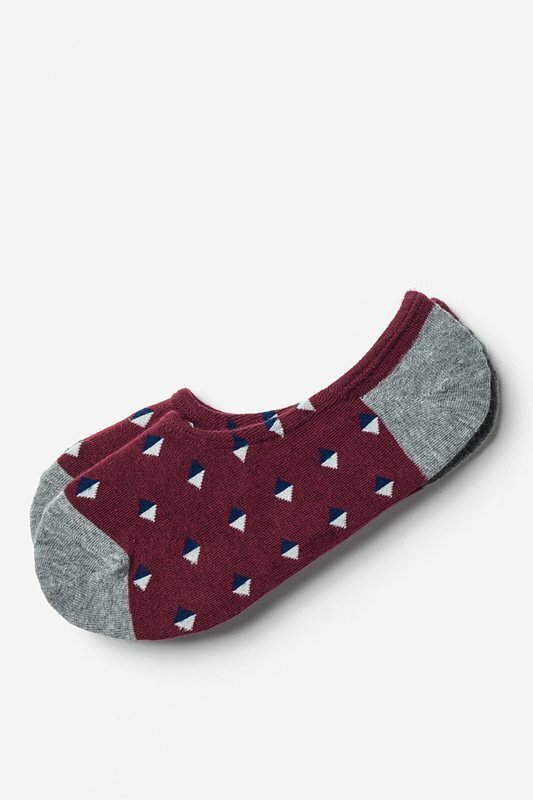 Troubadour Socks by Richer Poorer. Hudson Belt by Arcade Belts. Adventure Log by Word Notebooks. Wristband by Panorama NYC. Attending a great music festival often feels like multiple shows within one large, high-energy show — it’s fitting then, that my style blended multiple elements. To fight the heat (and yes, I’m aware I chose boots and denim), a linen-blend short-sleeve shirt courtesy of Old Navy worked quite well. Although the Navy color is now sold out, the white Flax Linen option on the site would be a reliable stand-in at your next music festival, with a much-needed linen blend and utilitarian chest pockets. It really was crucial to have versatile style, as the day shifted from a eclectic, mellow vibes of Oh Wonder to a high-energy set put on Daughter. The quickly changing scenery called for durable accessories, too — no busted watches or sunglasses left behind here. Plus, my Tread for Men Traveler Sunscreen was a big help in protecting me from the sun. Chief among the rest of those accessories was a new personal favorite, the outstanding Timex x Todd Snyder Mod Watch. It reliably updates a vintage style for the modern man. I accentuated that crisp watch with a fun-to-wear pair of Millbrook sunglasses via Steven Alan Optical, which clock in at an agreeable price on top of great looks ($165). Certainly, every cent helps when cooling down with some nice refreshments and powering through a day of great shows. 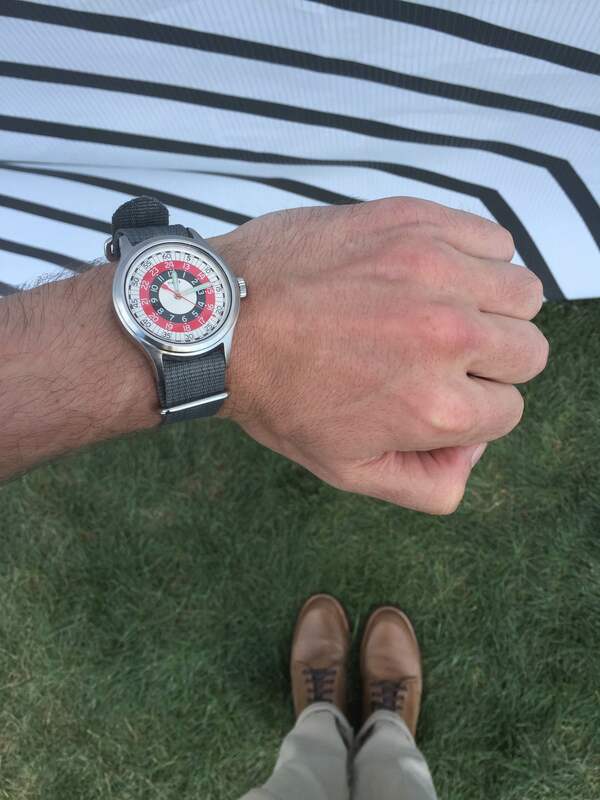 Keeping track of time during the day with the Mod Watch from the Timex x Todd Snyder collab. Natural Diplomat Boots by Thursday Boots. Slim Light Mercer Denim by Mott & Bow. Lest we think the day was all about the big-ticket items (and bands), small touches really do go a long way in completing an outfit, such as the Hudson Belt from Arcade Belt Co. It’s made with stretchy, comfortable and durable navy smartweave fabric, and the color worked well alongside my socks, the lightweight, breathable, teal-and-grey color-blocked Troubadour from the team at Richer Poorer. Those socks paired with my boots for an added touch of comfort, and that was crucial — it felt like a long run-up into the evening, but it really was worth it. That brings us back, once again, to The National. While I certainly looked forward to dressing for the day in style and checking out other great acts, I’d been looking forward even more to seeing the hallowed indie rockers return (relatively close) to their home turf. Seeing them two years ago at Calvin College back in my home state of Michigan was, to be quite honest, a lifechanging show (right up there with seeing Lucius at Daryl’s House Club in upstate New York earlier this year). And this time around, The National absolutely didn’t disappoint. Although the entire set was stellar, early renditions of “Don’t Swallow the Cap” and “Afraid of Everyone” were huge crowd-pleasers, as was an uptempo take on “Sea of Love” off of the acclaimed Trouble Will Find Me. Being that close to the stage for those songs was epic, seriously. The Dessner brothers are one of the tightest guitar duos around, and the Devendorf brothers reliably carry the rhythm section, too. What more can you ask for? They’ve got a discography that’s so deep and versatile, an hour isn’t nearly enough — even at a festival. A soul-stirring rendition of “Bloodbuzz Ohio” played well off of two new songs, “The Day I Die” and “Find A Way” fit right in with the rest of the band’s live set, which also managed to work in “England” off of High Violet. The variety in their setlist means you might hear your favorite track at an unexpected time, and it means you might have to wait a bit longer, too. “Fake Empire” was distinctive and well-done, cueing up the crowd for an intense, loud version of the classic “Mr. November” (just ask the folks next to me how much I enjoyed that one). Although Mr. Berninger stayed on stage for that song, he made his way into the crowd for “Terrible Love” — I’m surprised the fans let him go! It was nothing short of emotionally stirring and incredible, probably worthy of a full blog post in its own right. It was a two-year wait to see them, but I can only hope less time goes by before I see them again. If you get the chance to check them out at one of the many festivals they tend to play during the summer, please do. The same goes for their friend and a top-billed act in his own right, Sufjan Stevens. It was time to put away those sunglasses (and grab another round), as he powered through a visually stunning set — both The National & Sufjan could definitely play for twice as long, what with their deep discographies and high-energy stage shows. Of course, an act like Kendrick Lamar is a huge crowd-pleaser and puts on a high-energy stage show of his own, which drew by far the largest crowds of the day. It was a heck of a day that really was packed top-to-bottom — bands like Oh Wonder and Foals also rounded out the day nicely with afternoon sets that fit with the festival’s more eclectic vibe. Attendance felt a bit light at times, but it provided the chance to grab some prime real estate during killer sets by some of my favorite acts (particularly, as we all know…. The National). And gear like my durable Thursday Boots Natural Diplomat Boot and the Timex x Todd Snyder Mod Watch was really crucial to taking on such a hot and busy day in style. It was such an honor and privilege to be able to see a renowned act like The National, and the rest of the lineup definitely didn’t disappoint. We’ll see if Panorama sticks around next year, but if they continue to curate an eclectic lineup packed with big names and solid variety, there’s a great chance it will be — and I’ll be there with my best menswear to rock out! July 23, 2016 July 19, 2016 by Beau H.
Easygoing, effortless and still sharp — that’s the Mack Weldon Vesper Polo for you. Photo courtesy of Mack Weldon. So, you sidle up to the bar on a Saturday night — maybe on a first date. What are you wearing? A polo inspired by the crisp, clean, effortlessly cool style of 007, that’s what. My friends, we’re talking today about the Mack Weldon Vesper Polo, a heck of a polo that puts together the favorite style principles of 007 in one shirt. It doesn’t hurt that it’s named for the original (and perhaps best-known) drink downed by everyone’s favorite secret agent. The Vesper Polo nails everything you should look for in a stylish polo for summer — it’s got a clean, modern fit, for starters. And the lightweight micro-mesh knit fabric is exactly what you need to keep you cool and dry in the heat of July (we’ll have an #OOTD styling this exact polo next week, in fact). After checking one out myself during a hot and busy #NYFWM, I’ve got to vouch for that. Plus, this polo is everything great style should be — it’s understated, it’s refined, it’s easily wearable, and the price ain’t half-bad either ($68, for the unitiated). 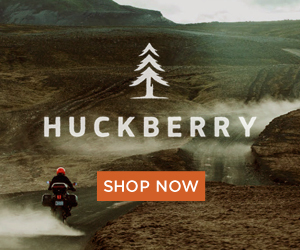 It’s part of Mack Weldon’s effort to expand on basics that work for every guy’s wardrobe — if you’ve shopped the brand or participated in our most recent reader giveaway with these guys, you know that all too well. Add this polo to your other favorites of theirs — like an easily wearable Pima Crew Tee — and you’ll be on your way to building a sharp wardrobe any day of the week. While the Kentucky Blue option looks great, Bond might go for the Total Eclipse Blue polo. Photo courtesy of Mack Weldon. Yet, the great thing about the Vesper Polo is that it’s a great place to start no matter your style level. 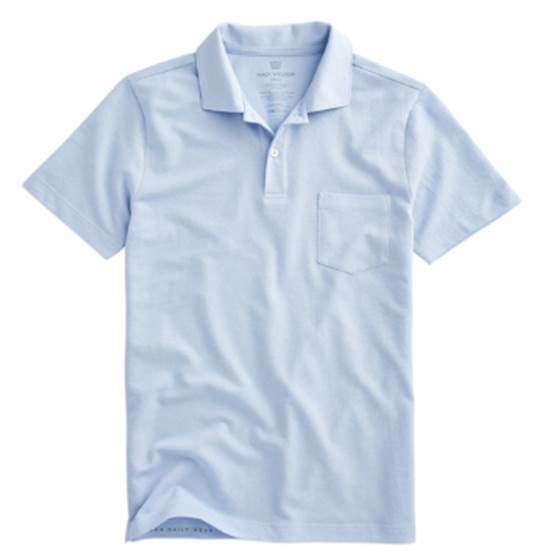 Seriously, every guy can use reminders about things like proper fit, and this polo makes it easy. 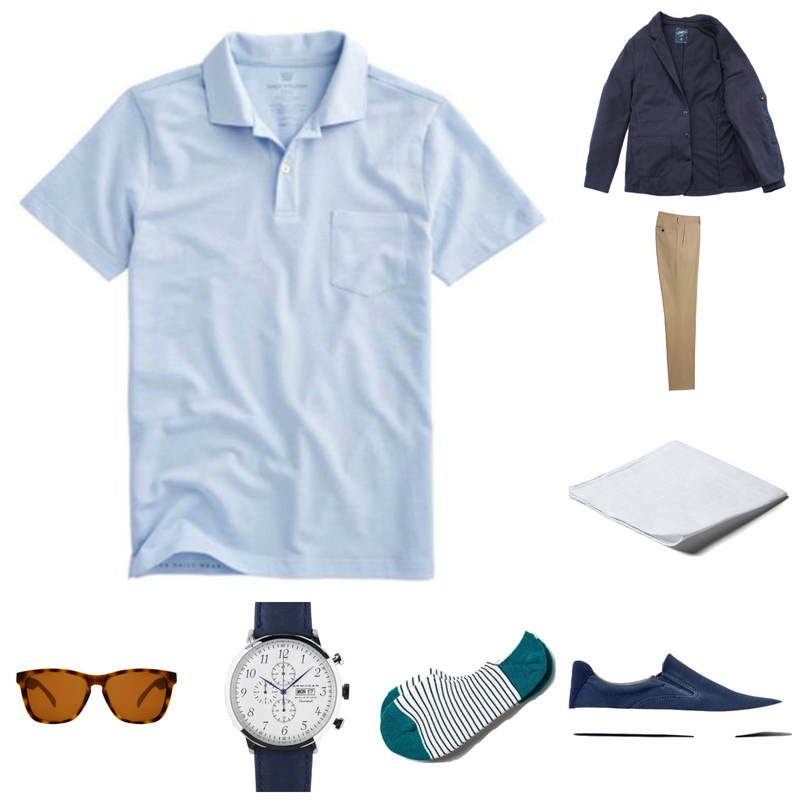 It’s wearable with slim shorts or tan chinos, and it doesn’t look out of place when worn in an even more laidback fashion — like atop your favorite swim trunks as you head to the beach or pool. And the self-collar doesn’t flop around like other polo collars — it’ll stay upright through the day (even moreso if you use collar stays), so you can rock it beneath a slim-fit khaki blazer to the office. The trickiest part about the whole endeavor might be picking a favorite color — the Kentucky Blue option seen here is reliable and crisp, yet that Total Eclipse Blue (a dark navy, really) is the same color favored by Bond in Casino Royale (although that option is a bit pricier). So you certainly can’t go wrong with a well-priced, well-performing, effortlessly stylish polo ready for the rest of summer (and even able to be rocked into early fall when layered under a shawl cardigan, for example. The toughest part is going to be putting it away when the weather turns cold — yet if you live in a warm climate, you’ll have the gift that keeps on giving year-round. Keep it handy for that next date in the meantime, yeah? Have you picked up the Mack Weldon Vesper Polo yet? What’s your favorite style combination when it comes to polos? July 22, 2016 July 22, 2016 by Beau H.
It’s quite tough to believe it’s already Friday around these parts — it genuinely seems like New York Fashion Week: Men’s just wrapped, and it also feels as if I was just in Michigan to attend my good friend Matt’s wedding (in style, of course). However, quick weekend trips tend to call for a quick turnaround time, and a busy week thereafter. Did you get the chance to catch all the content we pumped out this week at The Style Guide? To recap — that includes a new suggestion for styling twill pants, brought to you by Savane. Here’s a hint: Take the brand’s Premium Flex Twill Pant and match them up with other dependable style staples; seriously, it’s all there. Or perhaps you’re in the mood to do some shopping? We’ve got you covered there, too — grab one of the best men’s dive watches via this site’s latest Online Shopping Picks post. And lastly, let’s look ahead to the weekend — I’m quite excited to check out the first-ever Panorama festival this Saturday in NYC. It’s a cultural mash-up of art, technology and music, and that means some interesting exhibits, delicious food and drink and a bevy of great tunes from stellar artists — namely, personal favorites like The National, Sufjan Stevens and Oh Wonder, capped off by a heck of a headliner in Kendrick Lamar. 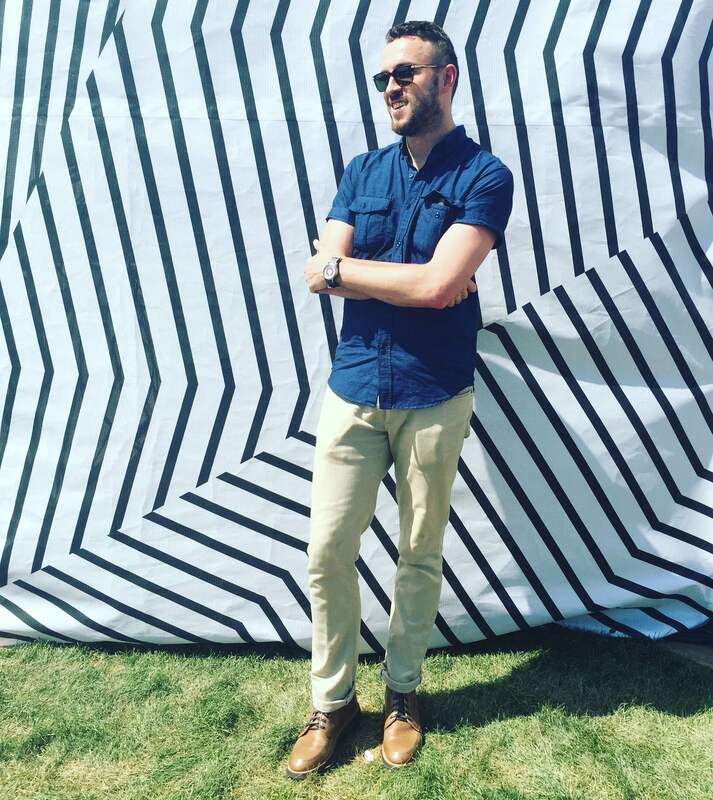 Of course, I’m very much looking forward to getting back to Randall’s Island, site of this year’s Governors Ball music festival, and bringing along some great #menswear for the ride. You can check out my Instagram for a full rundown of the day’s festivities in real time, and you can also follow along on Twitter. In the meantime, let’s plug in and look back on the week in #menswear. Speaking of that lauded hashtag, Fashion Beans covers eight men’s street style legends to know — like, right now. It’s a great list, packed with plenty of style inspiration for anyone interested in men’s style. If you’ve got a couple grand to drop, take a look at the newest watch from Piaget, the super-sharp and crisp Piaget Polo S watch — it’s the pricier answer to the best men’s dive watches covered here. 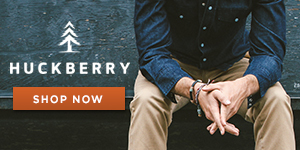 If you need a new pair of jeans (and who doesn’t? ), take a look at the very cool, very retro and yet very of-the-moment denim just launched by Levi’s — the Levi’s 505C is an update on an iconic, yet under-the-radar, style worn by rock stars and pop culture icons alike for decades. The good news for you is that the style comes in both a fresh light wash and a classic dark wash, among other options. And if I didn’t know any better, I’d tell you to keep your eyes peeled on Instagram this weekend for some music festival content surrounding these jeans (wink, wink). And speaking of brands that sit at the unique intersection of music and heritage — lovers of viral tunes are now set with a plethora of constantly updated global indie music, new from Radio Kangol. It’s an effort launched this week by the global headwear & lifestyle brand Kangol, and it uses a well-curated, deep series of intelligent-minded music labels to stream tracks that run the gamut from hip-hop to reggae to dance. It’s all in line with the brand’s connections to the music industry and its place on the heads of style and hip-hop icons alike — give it a listen here. Herschel Supply is teaming up with creative platform BHW to launch a series of ApexKnit backpacks that make use of a densely woven, high-tensile yarn to provide a hint of stretch and performance in the brand’s classic backpack silhouette; these backpacks are sleek, city-ready and commuter-friendly. Speaking of great backpacks — grab one (or five) stylish backpacks for summer travel via my latest post on The Manual — it won’t let you down, promise!